Fall is one of the special times of the year. The vibrant colors, the sparkling sun (which is very very soothing after the the burning summer sun of Texas), the light breeze with an occasional nip which reminds you that winter is not far away but at the same time makes you breathe in and soak up the warmth of the daylight, that sudden rustle you hear that gathers up all the fallen leaves to a heap at the corner – it is like the nature is whispering and planning to make everything around look and feel beautiful! It is also my little one’s birthday during fall. She turned 4 yesterday! Years are flying, whizzing by me real fast;I remember the first time I held her, touched her soft head with my cheeks and lips, breathed in that beautiful smell, touched her dimple on her plump pink cheeks and laughed at the big bubble she blew out of her mouth. Fours years later she is a vivacious, intelligent, sparkling little princess with a big sense of humor; my baby is getting big, but I am not ready to move at this speed. Here is what I did with a bunch of root vegetables I got last week. The vegetables still had dirt on them and I love it; the dirt tells me that the vegetables are fresh and crisp offering the best of the season. I did not want them to wilt in the fridge, so I prepared them all together in one dish. I had not planned to use the fennel bulb but I am really glad that I did. A simple recipe which becomes really special with the use of saffron. Saffron adds that mild but extraordinary flavor to the very earthy vegetables. Other Root Vegetables to Use: Turnips, Beets (Red or Golden), Celeriac. Take a large thick bottomed skillet or a cast iron skillet. Place it on very high heat and put the honey and the saffron in the pan. When the honey starts to bubble (after a couple of minutes), add all the vegetables except for the fennel bulb ( I like to save this for later as I do not like them overcooked; if you do not have such reservations add them now along with the other vegetables) to the pan/skillet and lower the heat to medium; stir and toss while cooking for about 12 -15 minutes till the vegetables are well coated and glazed. Drizzle half the amount of the olive oil on the vegetables; add the salt. Reduce the heat to somewhere between low to medium and continue cooking for about 10 -12 minutes. Add the wedges of the fennel bulb now if you have not done it before. Cook till the vegetables are cooked though, but still firm, for another 15 minutes. You will know it is done when the vegetables are fork tender and have light brown spots/coating on them. (Make sure to use an oven proof pan/skillet). 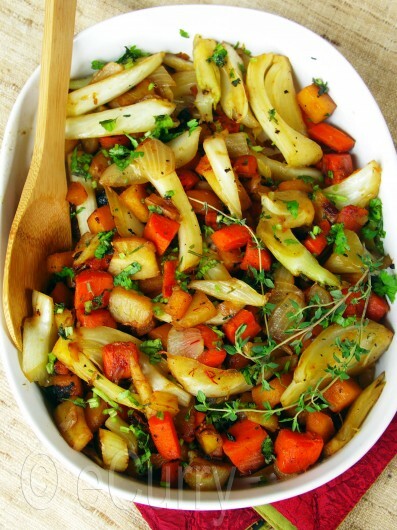 Transfer the skillet in a preheated oven (425 Degree F), and roast the vegetables for about 25 – 30 minutes or until cooked and glazed. Combine the rest of the Olive Oil, Vinegar/Lemon Juice, Crushed Black Pepper, Red Pepper and some chopped Thyme (or any other herb if you are using). Pour the mix on the cooked vegetables and toss well to combine. Serve them with a sprinkle of chopped parsley and garnish with thyme sprigs. The key ingredient here to making it wonderfully fragrant was definitely Saffron. Serve as a warm salad topped with feta or goat cheese or cheese of your choice. I am not too fond of cheese; I like mine on some couscous or on a bed of wild rice. This dish also serves as a marvelous side dish, esp. when cooked for cozy, warm friends/family get together. This is going to the NCR hosted by Lisa of Lisa’s Kitchen. November 18th, 2009 | Category: Dry Fries, Salads & Soups, Sides & etc. Happy bday to your little one! And yes, fall is a magical season 😀 I love the pictures on this post, the colors are delicious. Many more Returns to little one, Yes, years will fly but we still think is like yest! I like all the color in one pot like fall! That is such a refined side dish! Great flavors and colors! just the name of this dish makes me want to grab that bowl and start eating! You know I always am stunned by ur pics..don’t u? 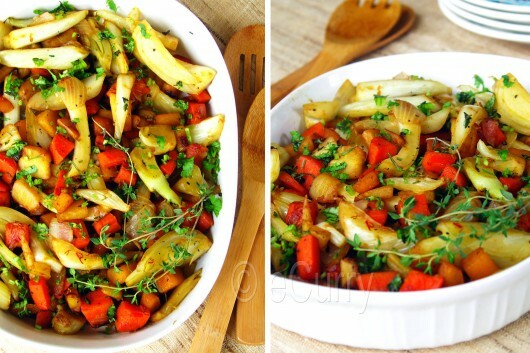 Well I adore root veggies be it turnip or carrot, arbi or potato, I love them all, and yes when Crisper of refrigerator is loaded with fresh veggies, I too have this temptation of using them all at one go, so I am sure this recipe will help me use up all my fav. veggies in one NO-Nonsense side dish. And Belated Birthday wishes to the little BIG girl..I absolutely agree with time flying by when it comes to growing up of kids..I cant believe mine will turn 7 next month..where had my years gone?? Happy Birthday to your little angel 🙂 Love the saffron and honey glazed root veggie dish, pictures have come out stunning! Beautiful and indeed vibrant, the plate is just bursting with goodness. Belated b’day wishes to you lovely daughter. The colorful vegetable are a beauty to behold. First of all a blated happy birthday to your lovely angel. love the colour of the dsih it truly represent the colours of fall. A very happy birthday to your lil one. Happy Birthday My princes ! what a lovely dish…I am in a state of forever awe every time you post something ! Happy belated birthday to your sweetie! Birthday wishes to your little one! 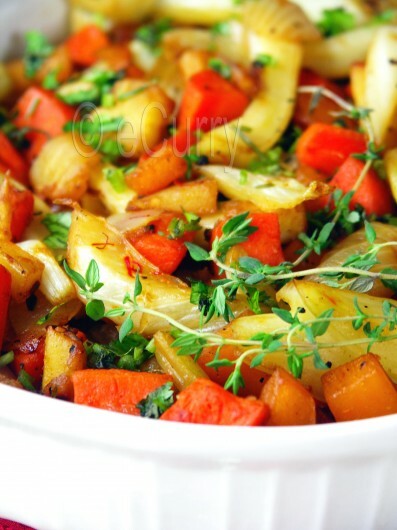 Love the different combination of veggies in the recipe.I am going to try the oven version. Happy birthday to your little one! 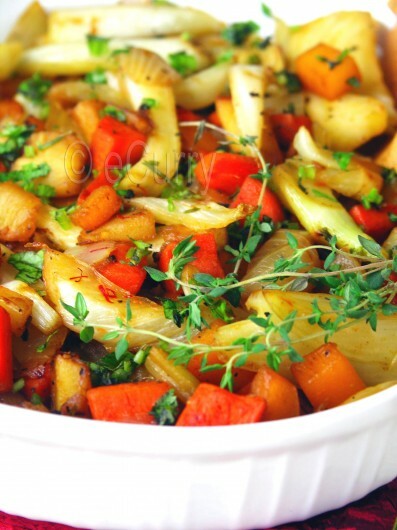 The vegetables sound so delicious flavored with saffron and honey! Oh your pictures are to die for! That is one hearty and colorful bake. Just breathtaking, Soma!Lovely colors there! Yum, just the title makes my mouth water. How delicious! vat a colorful dish!! m loving the combo!! great job! Happy birthday wishes to your sweet daughter. The dish sounds very healthy and beautiful in colour and flavour. First of, happy b-day to your little princess! Second, your dish looks so good! Very colorful. Saffron and honey must liven the overall flavor. Yum! Lots of birthday wishes to your little girl. What a great way to prepare fresh winter veggies. Looks so colourful and fresh! Soma, happy birthday to your little one! I also like dirt on my root vegetables; as you said, it shows how fresh they are. This dish sounds healthy and looks beautiful. Your photography is amazing as usual! This sounds like a healthy nutrition bomb with all these veggies. It looks gorgeous! Colors look so pretty and vibrant, so much like fall. I looked at the list of vegetables and relaised I have not eaten so many of them. 🙁 I am so stuck to the usual suspects. This is a beautiful entry with gorgeous pictures. 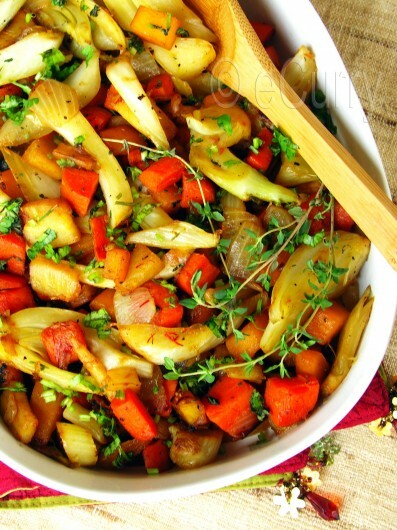 This is definitely a celebration of some of fall’s best veggies out there. I love the use of saffron and honey. I plan on making something like this soon. Happy belated birthday to your daughter! Great shots, the saffron gives the veg a nice colour!